LADIES BALL “Love Satisfaction” | STREETS OF NEW YORK 411 INC.
Bobby Clarke Entertainment in association with Ireijam Radio presents LADIES BALL “Love Satisfaction” on Saturday February 8th This is a very unique Pre-Valentine Affair that will feature the hottest Reggae Balladeer’s in the music industry. Tarrus Riley – He was born in the Bronx, New York and raised in Jamaica. Among his accolades are Best Singer, Cultural Artiste, Song of the Year, and Best Song. Some of the awards institutions which have rewarded Riley include the Youth View Awards, The Star People’s Choice Awards, EME Awards, and the Reggae Academy awards. Tarrus is the holder of Jamaica’s CVM TV’s 15th Anniversary Award. I-Octane – Reggae and dancehall artist from Clarendon Parish, Jamaica. He is known for integrating positive and socially conscious subject matter into his music, drawing inspiration from personal experiences and Rastafarian teachings. Christopher Martin – A singer/songwriter from St. Catherine, Jamaica. Chris won Digicel Rising Stars in 2005 (the Jamaican version of “American Idol”) and is best known for the songs “Take My Wings”, “Giving It” and “I’ll Be Your Driver”. Christopher Martin supersedes many talents currently gracing Reggae Music. There is no comparison to his vocal ability, outstanding stage performance and his star quality presence he seamlessly aerates to the world… he is more than just an artist, he is a musical icon. Kranium – A Jamaican born, but Queens NY raised 23 year old singer. He is a local talent who has captured the streets with his smooth soulful tone. Ladies from all around the world already adore him. Kranium’s debut single “Nobody Has To Know” is making major head way and this young singer has a bright future ahead of him. 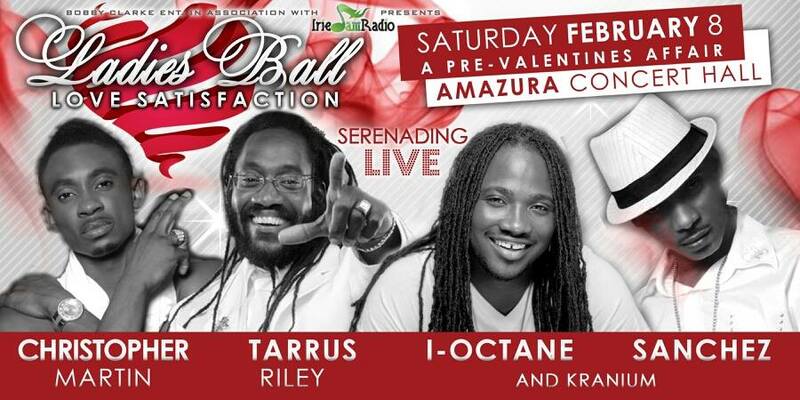 Come early to enjoy a full Ladies Ball Experience… Showtime 12 Midnight featuring Chris Martin, Sanchez, I Octane, Tarrus Riley and Kranium. Brooklyn – Topaz Restaurant. Silver Krust Remsen Ave. Golden Krust Pitkin Ave.
New Jersey – Tastee’s Rest. Newark, People’s Choice Rest. East Orange.